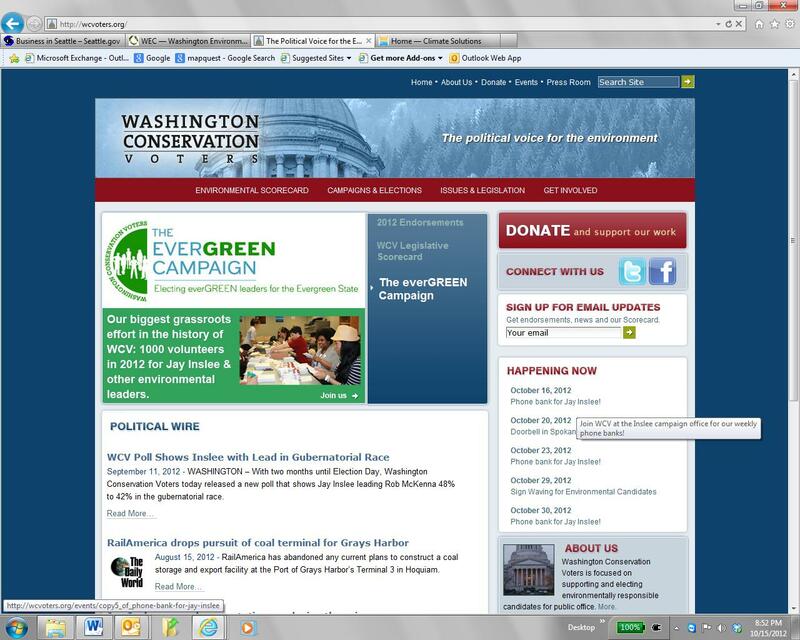 Site name and description: Washington Conservation Voters: “The political voice for the environment.” Washington Conservation Voters is the statewide political voice for the environment. We work to elect environmentally responsible candidates to state and local offices. Working with our allies in the community, we advocate for strong environmental policies and hold our elected officials accountable during the legislative session. Through our political work we are strengthening laws that safeguard the health of our communities, the beauty of our state and our economic future. Design overview: Red, white and blue color scheme and capitol dome fit the organization’s focus on politics. Simple design. Not a very large web site in terms of number of pages. Audience: environmental activists interested in politics as a method to make changes. Voters interested in environmental issues. Provide information about candidates and elected officials and their record on important environmental issues. Help environmentally-friendly candidates get elected. Provide opportunities for political environmental activism. Since it’s a non-profit, request for donations is present – easy to find and call to action is not aggressive. Very informative. Information presented is easy to find and navigate. Simple, clear design and structure. Information on voting records of legislators (“Environmental Scorecard”) is easy to find, high on the page on a menu bar. Election endorsements and priority issues are on the same menu bar. Site provides weekly updates during legislative sessions. This provides a reason for people to keep visiting the site.